Did you know that the Rose is the National Flower? People have been asking for over a year now for a video tutorial for the Rose Cake. After posting the Neapolitan Rose Cake a week ago and getting a few more requests, I finally did it! 2. Just how quick and easy it is. This video is mostly in real time. 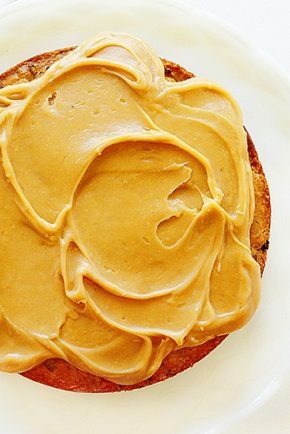 You really truly can frost a cake like this in less than 10 minutes. And if you are making all one color it is even quicker. As you can tell, I made this cake in honor of patriotism… Memorial Day, the Fourth of July, Veterans Day, Flag Day, an Inauguration, basically any occasion that red white and blue is appropriate! I get all my frosting’s ready and place in plastic disposable pastry bags. I then prepare a bag with a 1M tip in it for every color I am using. Here I used three colors, so I had three bags ready. You can go through a lot of frosting making those roses, and its good to have an extra bag ready to switch out. Also, I really didn’t do a crumb coat. I have done it with and without a crumb coat and find they both work. The reason I can get away with not doing a crumb coat is because I tend to squish my roses together to avoid any dead space. When making the bottom layer of blue roses around the cake, I tried to stop applying pressure at the top of my rose, where the next layer would be covering. Then simply go right over that edge on your next row. 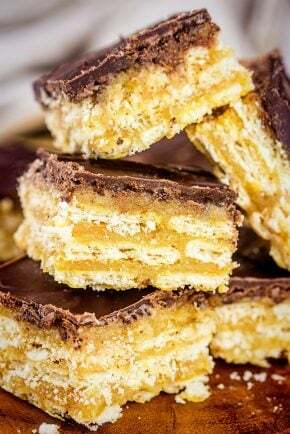 Overlapping is a very good thing with this cake! As you can see in the video, I went fast and didn’t worry about perfection with each individual rosette. There is no editing (other than exposure/color) done to the pictures I have posted. (The pictures were actually taken with my phone.) It’s the same cake in the pictures and video. The ending cake is still pretty good, even though you saw many errors throughout the video. That is just a testimony to how forgiving the Rose Technique is! A few have asked, so here is a link to the gel food coloring I use to achieve such deep colors! 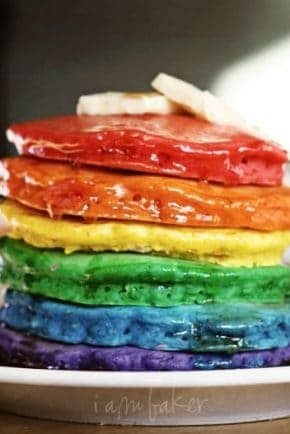 National Pancake Day- Eight Amazing Pancake Recipes! Here is my picture of my cake using this tutorial. I have some practice to do on my piping skills, but it turned out pretty good. Thanks!! Can i see the tip that u used? 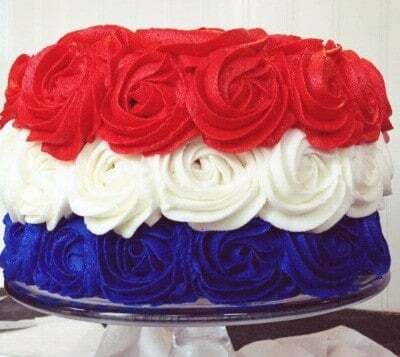 Andrea Blondell on Facebook is using your photo of the patriotic rose cake on her page. She has just been called out by Stop the Cake Theif for claiming other’s photos as her own work. Hi! 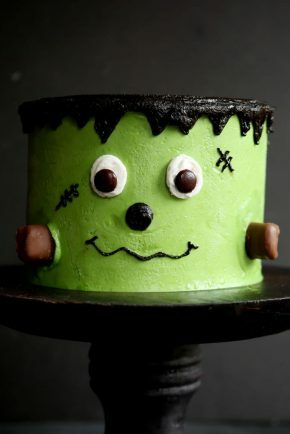 What size cake pans do you use when making the cake part of this? Are they 8″ or 9″? What cream do you use for the rose? Do you have the recipe for the cake and the Buttercream please? It looks so good! !